In an effort to prove that Google is a serious threat to the personal privacy of people everywhere, the National Legal and Policy Center has exposed countless Google Street View pics that detail what are likely the home, cars, and daily commute of top Google executive Larry Page. Responding to Google's addled defense of Street View in an ongoing Pennsylvania court case, the privacy watchdog just unleashed a seven-page PDF that hoists Larry Page by his own petard - without actually mentioning the name Larry Page. Compiled in "less than 30 minutes," the report reproduces Google Street View photos that appear to reveal Larry Page's cars, Larry Page's license plates, the name of the landscaping company Larry Page uses, the name of the home security company used by Larry Page's next door neighbor, the distance from the street to Larry Page's front door, and Larry Page's likely driving route to Google's Mountain View headquarters. "There is no better evidence that individual privacy simply does not exist in Google’s world than by the chilling amount of detailed visual information Google now collects on all of us, information that any Internet user can now compile in a dossier in less than 30 minutes," reads a canned statement from Ken Boehm, Chariman of National Legal and Policy Center. "The fact that every American is now subject to this type of scrutiny with the click of a mouse is frightening." In recently revealed court documents, Google defends its spycar-fueled Street View abomination by claiming that "even in today's desert, complete privacy does not exist." But Boehm and the NLPC point out that when speaking to American politicians, Google also likes to say things like this: "Google takes privacy very seriously." "Perhaps in Google’s world, privacy does not exist, but in the real world, individual privacy is fundamentally important and is being chipped away bit by bit every day by companies like Google," says Boehm. "Google’s hypocrisy is breathtaking." Ah, but the NLPC doesn't take privacy as seriously as it would lead you to believe. Its seven-page Larry Page report avoids naming the Google exec, and the Virginia-based privacy watchdog is careful to redact his address. But as our friends at Valleywag point out, you can remove those redactions - in about 30 seconds. Here at The Reg, we really care about privacy. 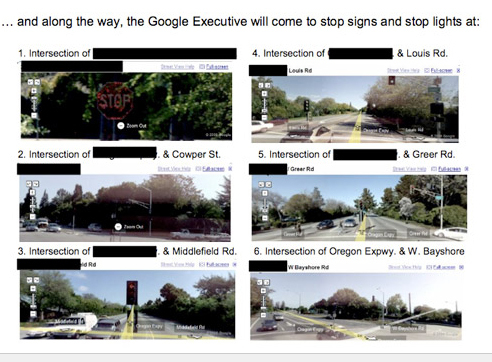 When we redact Larry Page's name from a story that shows Street View invading his own personal space, we have no problem telling you we're talking about Larry Page.